These turkey meatballs are extra tender and flavorful because of a few surprising ingredients, tomato paste, sweet potatoes and garbanzo bean flour. I made a video to show you how easy it is to make these scrumptious healthy meatballs which have become a weekly staple at my house. We love them! These are the meatballs we can’t stop eating. Luckily everyone in my family is crazy for them because it’s taken me some time to develop the recipe and so far nobody has complained that I keep cranking out batch after batch. The meatballs keep getting devoured. 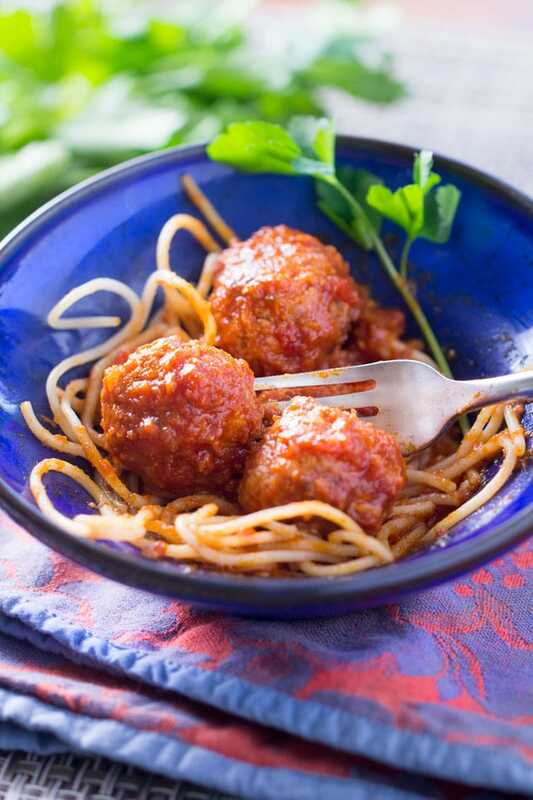 One of my favorite quick and easy dinners is to simmer these homemade turkey meatballs in Rao’s (store-bought) marinara sauce and serve them over angel hair pasta. I also love them over spaghetti squash, for a healthy low-carb dinner. Sometimes I’ll make a quick homemade marinara to go with them (scroll down for the marinara recipe). What sets these turkey meatballs apart from typical Italian-style meatballs is of course turkey instead of beef and pork. 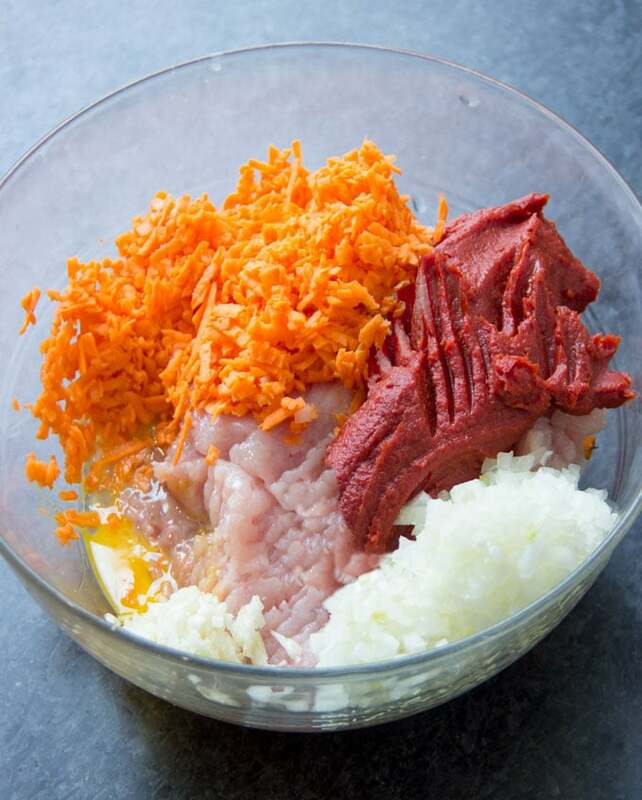 But also a few ingredients that you don’t generally see in meatball recipes: grated sweet potato, tomato paste, and gluten-free flour. Unlike other Italian style meatballs, there’s no cheese, bread or milk in this recipe. These turkey meatballs get plenty of flavor and texture from vegetables. Onions and garlic are the aromatic components. 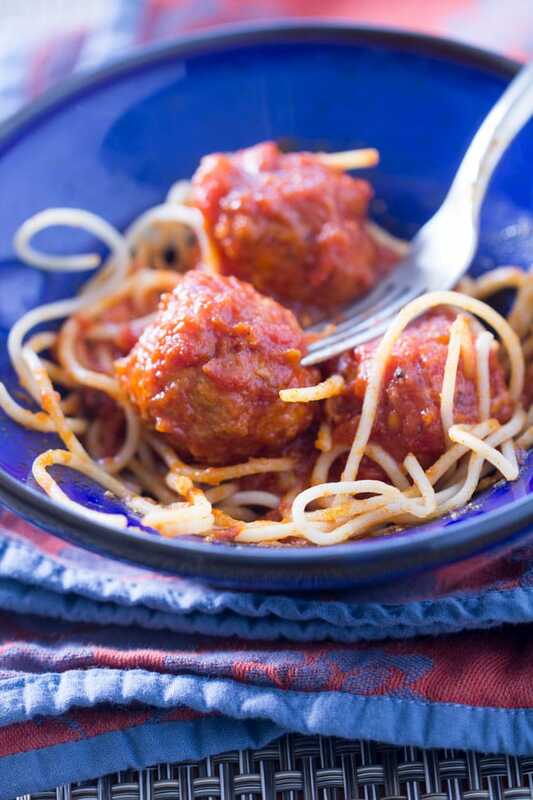 Grated sweet potato gives the meatballs a wonderful texture and an earthy sweetness. Tomato paste adds a rich umami taste. The flour makes the mixture just dry enough to roll, but leaves it with a super tender consistency. Combine ground turkey (I like to use half dark meat and half light meat) with chopped onion, minced garlic, an egg, tomato paste, grated sweet potato, salt and pepper. I grated the sweet potato on a box grater. I used the largest holes and then chopped up the shreds a bit more on a cutting board. Brown them in two batches. Simmer the meatballs in your favorite marinara sauce for 25 minutes. My favorite is Rao’s. Fresh basil is optional but so good! If you can get some, sliver 10-12 leaves and stir them into the sauce before serving. *Another option is to add the canned tomatoes whole and puree the sauce at the end with my immersion blender. My kids like their tomato sauce extra smooth, so I usually use this technique. There’s nothing that says comfort like Italian-style meatballs with tomato sauce. These little polpette (Italian for “meatballs”) are super tender and flavorful, gluten free, dairy free and low fat. So feel free to come back for seconds or even thirds! I want to give a shout out to my friend Nina who gave me the idea of putting sweet potatoes in meatballs. Such a genius idea. Thank you Nina! 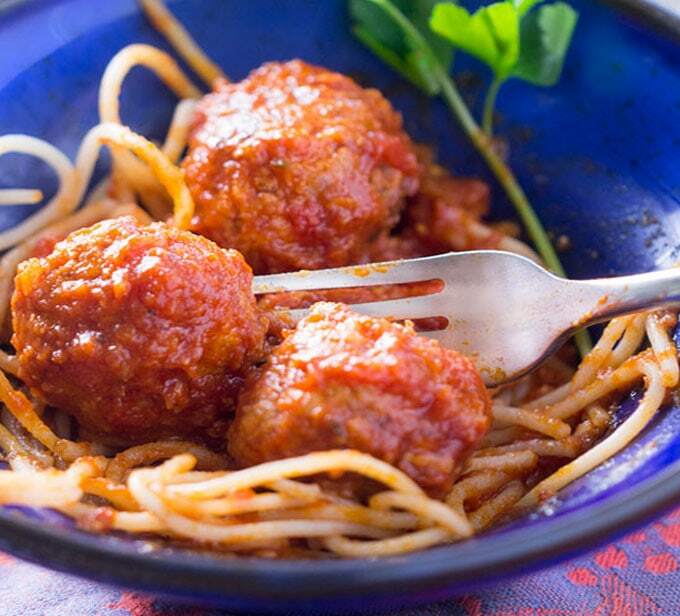 This Italian-style turkey meatball recipe is a great one to have in your repertoire. It’s light on fat and carbs and heavy on lean protein and veggies. Eating these tender turkey meatballs in tomato sauce feels like a big delicious, comforting splurge, but without the guilt. Here’s the recipe for Italian Style Turkey Meatballs. If you make these, I hope you’ll come back and leave a comment to let me know how you liked them. 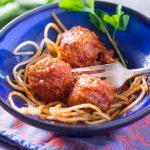 These turkey meatballs are extra tender and flavorful and naturally gluten free, made with lean ground turkey, grated sweet potatoes, chickpea flour and tomato paste. 3 tablespoons garbanzo bean flour or garbanzo bean & fava bean flour Or substitute bread crumbs if you like. In a large bowl, combine ground turkey, onion, garlic, egg, tomato paste, sweet potato, salt and pepper. Stir with a fork until everything is well mixed. Sprinkle in flour and stir until just combined. Cover the bowl with plastic wrap and chill in the fridge for at least 1/2 hour or up to 4 hours. You can omit this step, but the mixture will be mushy and harder to shape into balls. The longer you chill the mixture, the easier it will be to roll the meatballs. Set a large plate on your work surface. Roll all the meat into balls – a heaping tablespoon at a time. Set the meatballs on the plate as you go. If your hands are getting sticky, fill a small bowl with ice water and dip your hands in periodically. If your hands are cold and wet, the meat is less likely to stick to them. 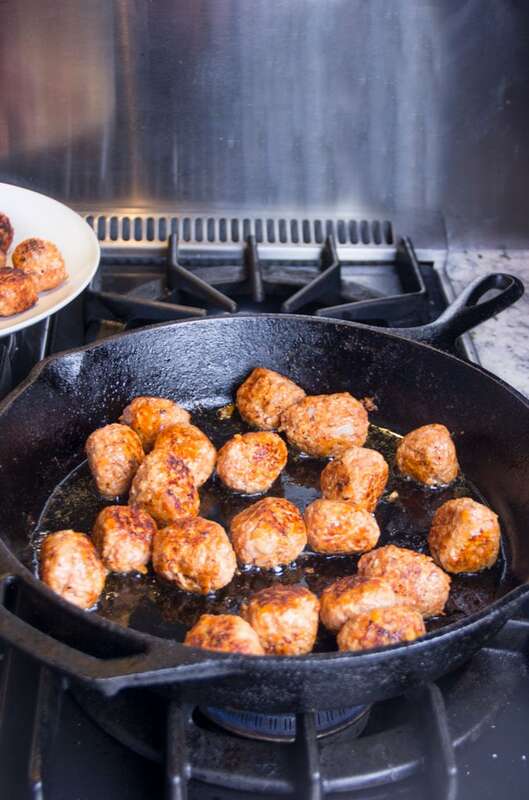 Once all the meatballs are rolled, heat 2 tablespoons of oil over medium heat, in a large heavy skillet, preferably cast iron or non-stick. Once the oil is nice and hot, add half the meatballs. Sauté the meatballs for 5 minutes or so, turning them gently with a spatula every minute or so, to brown them on all sides. Transfer the browned meatballs to another plate. Cook the rest of the meatballs, adding more oil if the pan is dry. 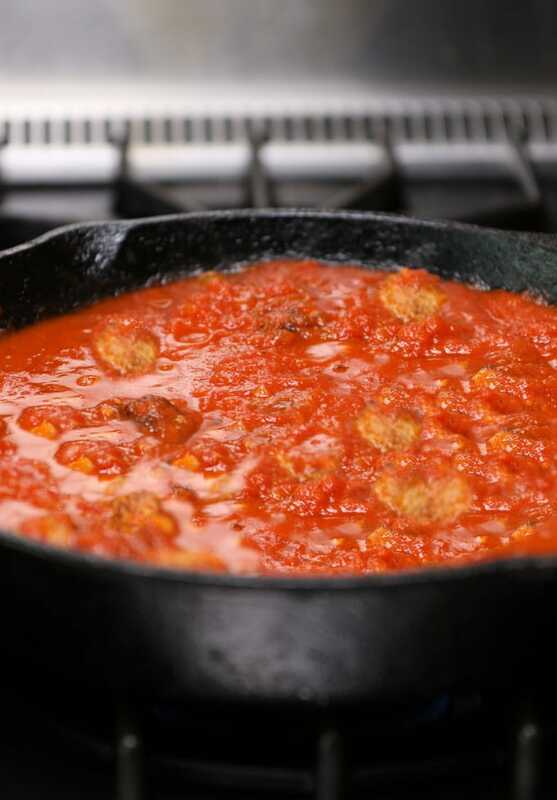 Return all the meatballs to the skillet and add 4 cups of your favorite marinara sauce and 1/2 cup of water. Simmer the meatballs in the sauce for 25 minutes, until they’re cooked through. Omgomgomgomgomgomg I use to eat Meatballs every Monday with my friends, and these were literally my absolute fav! Like omg they are so killer! And a great source of protein and GLUTEN FREE!!! So yummy it’s just to die for! I had these for dinner as my weekly Monday ritual. I don’t think I would have made it thru the week without them! 🙂 I’m so happy to hear it… and btw, meatballs once a week sounds like a great ritual! I had these ritually every Monday. I don’t think I would have made it thru the week without them! I made a double batch of these for a meatball-themed gathering and they were great! Made these for dinner tonight and they were well received! I did have to sub grated carrot for the sweet potatoes (since we apparently ate them all last night). Seemed like it worked well. Can’t wait to try some of your other delicious looking meals! That’s great to hear Sharon. I’m so glad you all enjoyed the meatballs and that the recipe worked with carrots. Thanks so much for letting me know! Lisa, these are as light and fluffy as you said they would be. We loved the sweet potato as an additional flavor. It’s a great, healthy alternative to meat meatballs. I loved the video- so skilled! 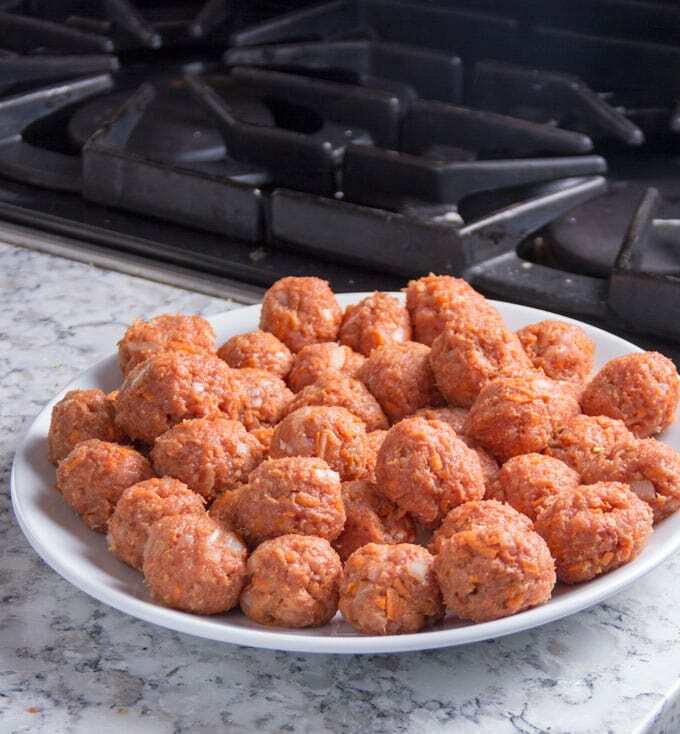 I’ve never met a meatball I didn’t like, and I don’t see it happening any time soon. These look SO good. Definitely need to have a pasta night soon! Made the meatballs tonight and love them!!! So good to know about the bean based flour–who knew?? Like the video – very catchy tune! For me a video would be super beneficial when there is a tricky step or unusual prep of a less common ingredient – so more instruction themed?? What the video did do in this case is re-enforce how simple and easy it is to make these. Not sure what I think about garbanzo flour (new one for me) – will report back. Thanks Joel. I agree that a video is extra helpful for the trickier recipes. You’ll like my next video that I shot yesterday. It’s a recipe that seems very difficult. But once you see the video, I think you’ll feel like it’s doable: Turkish Cigar Borek. If you make the meatballs, I hope you enjoy them as much as we do. Wow, fantastic job in your first video, Lisa!! Hope you’re all feeling better and we can reschedule the visit soon. Thanks Aviva. I’m pretty happy with how the video turned out. Still have to get better with lighting… I am feeling better and I’ll look at the calendar. I would love to visit you! Gotta love a recipe that no one in the family complains about! Hahaha – you’re so right!